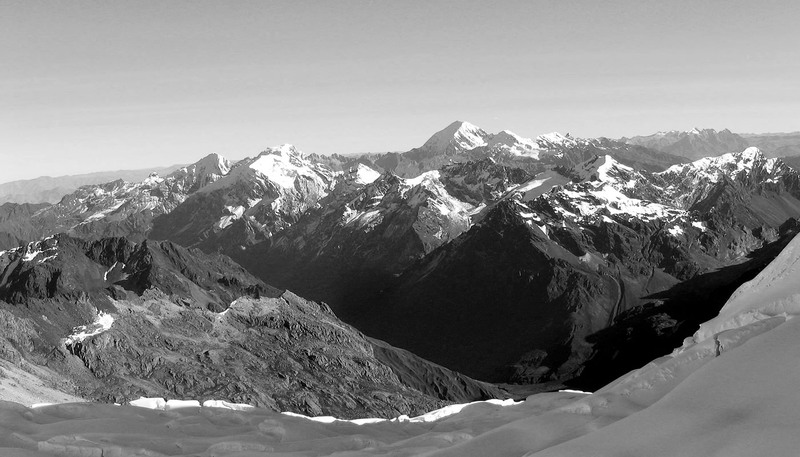 This Climbing Life first appeared in Alpinist 40—Autumn 2012. You feel like you are seeing everything now. Nothing was happening, and now everything is happening. Why does your sight seem so sharp and clear? Danger has a way of cutting through the melancholy, the real fear blinding you to the fear dimly imagined. If you could only always just have escaped death, you would never be sad again. Reading his words with the advantage of hindsight, I can't tell whether Arnold's subject matter was somehow prescient or simply a poet's natural attention to the largest issue. At the time he went missing, Arnold was only forty-one. He'd published two volumes of poetry to great acclaim, Shells, a Yale Series of Younger Poets selection in 1999 and Made Flesh in 2008. He'd won numerous awards including the Rome Prize of the American Academy of Arts and Letters. The search for his body was abandoned as too dangerous. Identification of his tracks had been confirmed by his footprints: earlier in the journey he had photographed his own footprint in lava. It must also be true, at least I hope it is, that if you don't escape death, you'll never be sad again either. THE MORE I THOUGHT about Arnold, the more familiar the scenario began to feel. I'm surprised only when I know a climber who disappears. Otherwise, disappearance, oblivion, are the long-standing highest stakes for those who push themselves to the edges. Poets, too, push beyond the quotidian. The first large mountain I ever climbed was also a volcano: Popocatepetl. In 1971 the summit was still snow covered, shimmering above Mexico City with its partner Ixtaccihuatl like a twinned mirage of winter. If you go to enough Mexican restaurants, you'll eventually see a mural of these two peaks, Popo, the smoking warrior, and Ixta, the sleeping woman, painted in festive, almost lurid, hues. At age eighteen, I'd met a group of like-minded climbers at my university, and beyond the rudimentary equipment—axe and crampons, Goldline rope and swami belt—the peak required only desire and perseverance. Those qualities I had. The gear I cobbled together. Much chance led me to this mountain, yet I can trace an interest in volcanoes to an early age. In third grade, I became transfixed by a diagram in a geology book that illustrated a cutaway of a volcano. The drawing came from the 1950s, and it looked like a cross-section of a human heart, the roots of a giant oak or the chambers of hell. When I went outside on rock-collecting "expeditions," I couldn't even find enough to fill an egg carton, much less glimpse volcanic activity. Fate had cursed me to live in a geology-free zone, suburban Detroit. The neighborhood had been bulldozed to near bedrock and built up again. The developers planted a lone maple in front of each house. Everything else had been scraped away, as if scoured by an ice-age glacier. During the bus ride to school, I told an older boy about the picture. They were studying geology in his sixth-grade class that very day. Somehow it was arranged, based on this kid's enthusiasm for my apparent knowledge, that I should come to his class and talk about volcanoes. I was flattered by the attention. I knew the terms magma, lava, vents and fumaroles. Even, the rabbit-out-of-the-hat: pyroclastic flow. But the teacher—a Felician nun—was not happy. She wanted to know why the volcanoes erupted. I thought I'd covered that topic: molten lava, pressure, building pressure and voila, eruption. No. She wanted to know why the core of the earth was molten? Why it erupted. I started to repeat myself, pressure, etc. No, she said, you don't know. This statement produced a feeling I'd recognize many years afterward in graduate school during comprehensive oral exams. She thanked me, curtly, and sent me back to third grade, ears burning. Thus ended my short career as a geology lecturer. Only now do I realize what she may have wanted. The theological explanation: Hell. On top of Popo, there was both heaven and hell. The rim of the volcano revealed a deep crater with a tiny blue lake at its bottom. Sulfur leaked from various vents in the snow. The summit, like every other summit I'd reach in Mexico, was adorned with an iron crucifix. Orizaba rose in the east, and Ixta was just across the pass to the north, together singing their siren songs. I left Mexico intending to return as soon as possible, which turned out to be two years later. On this venture, I traveled alone, with no itinerary except to visit the tops of as many mountains as possible. I was twenty years old, and I had my own gear, which now included a Perlon rope and the stoutest mountaineering boots of the time. My idea was to write a guidebook; thus, I considered my meanderings to be "research." At a store in Mexico City that catered to American tourists, I found a novel in English, Under the Volcano by Malcolm Lowry. The cover, which pictured a glimpse of the muralist Diego Rivera's Day of the Dead, stated that this edition was unavailable in the US. At the time, I naively thought that it was censored, a forbidden book. I was wrong, of course. And I learned that although I was reasonably well prepared for the climbing I planned to do, I was not at all prepared to read Lowry. High on Ixtaccihuatl, I suffered from food poisoning and altitude sickness, which resulted in a hallucination that a demon was sitting on my chest with the sole intention of pinning me to the mountain forever. I was able to shake him off, but my subsequent wandering, shoeless on the glacier, led to frostbite, and I was lucky to make it down to the hospital in Mexico City. ...from these mountains emanated a strange melancholy force that tried to hold him there bodily, which was its weight, the weight of so many things, but mostly that of sorrow. He trudged the slope of the foothills...alone. With ventilated snow goggles, with alpenstock...pockets full of dried prunes and raisins and nuts.... And now he had reached the summit.... But there was nothing there: no peaks, no life, no climb. The Consul believes that he's falling into the crater. In fact, his drinking binge has ended in a cantina where he gets shot. His body is dumped into a ravine. A dead dog is thrown in after him. Lowry himself did not live to age fifty. The coroner described his end as "death by misadventure," by which he meant a lethal combination of alcohol and sleeping pills. Lowry had written, "I love hell. I can't wait to get back." It was the Consul who said those words in the novel, but that fact is sometimes elided from the attribution. A writer is sometimes his own best fictional creation. Popo erupted before the turn of the last century, and its snowy dome melted away. It remains closed to mountaineering. Lamantia presented some of Hoffman's work at the famous 1955 Six Gallery reading in San Fransisco, an event thinly fictionalized by Jack Kerouac in The Dharma Bums. (Delicate Francis DaPavia read, from delicate onionskin, yellow pages, or pink, which he kept flipping carefully with long white fingers, the poems of his dead chum.) That night, the same audience listened to Ginsburg proclaiming Howl. They also heard Gary Snyder, who turned out to be another volcano poet. The opening section of Snyder's book, danger on peaks, is a personal history of Mt. St. Helens described over a lifetime of familiarity. He first climbed the volcano on August 13, 1945: "I made my summit petition to this shapely mountain, 'Please help this life.' When I tried to look over and down to the world below—there was nothing there." Upon his return to Spirit Lake, Snyder read the news of the atomic bombings of Hiroshima and Nagasaki, the estimated 150,000 dead, and the declaration by an American scientist that "nothing will grow there again for seventy years." huckleberries and fireweed, all the way. MT. ST. HELENS was once an almost perfectly shaped snow cone. Only a learned eye could distinguish its photograph from one of Fujiyama, the sacred mountain of Japan. I consider myself lucky to have climbed it in its perfect, platonic form, five years before the pyroclastic event. Despite the intervening years, I remember the details of the ascent well. My friend John and I drove from Seattle with the intention of climbing the Forsythe Glacier the next day. We arrived late and wired, and after a few sleepless hours in our overly warm sleeping bags, we decided just to head up under the light of a fullish moon. The summit was unexpectedly flat, its crater filled in to form an enormous, nearly level snowfield. Who would not be moved to prayer, with all the world spread out at our feet, Mt. Hood, Adams and Rainier shining on the horizons, treasure houses awaiting our arrival? In geologic time, of course, five years is a single historic moment. It's as if our summit day and the eruption occupied the same drop of water on the back of a whale. NATURAL DISASTERS SEEM PREVALENT these days, along with a vague sense of end times. In 2010 Mt. Merapi erupted again in Indonesia, killing more than 150 people. One of the casualties was Mbah Maridjan, the volcano's spiritual gatekeeper. The Sultan had appointed him to the post in 1983. Despite government-ordered evacuations, Maridjan refused to leave his home. His burned corpse was found in a position of prayer, and he was buried alongside the grave of the previous gatekeeper, his father. Maridjan was eighty-three years old. He seems a sort of shamanistic figure, a strangely divine remnant from an earlier century. And yet, when Mt. St. Helens blew up in 1980, so went Harry Truman, the longtime caretaker of the Spirit Lake Lodge. People who knew him surmised that he never expected he wouldn't have time to evacuate. He now rests 150 feet under Spirit Lake at the foot of the mountain, with his 1956 pink Cadillac, sixteen cats and untold hoarded assets, some perhaps left from his bootlegging days or accrued more slowly in his fifty-four years of residence. At the time of the eruption, Truman, like Maridjan, was eighty-three. I'VE BEEN on Mt. Rainier, the Cascades' highest volcano, more times than on any other mountain. Every ascent is a gift. In 2006, three decades after I first climbed it, John finally reached the summit with me. The year before, I'd been diagnosed with cancer. Although the surgery was successful, the disease took an unexpected psychic toll, by which I mean I hadn't thought it would fill so much of my consciousness. Mt. Rainier was the first mountain to which I returned. This ascent was uneventful, just the way you want it to be while you're climbing, though that doesn't make for much of a story afterward. We hit the edge of the crater early enough in the morning and trudged across it toward the summit on the south side of the rim. In late season, the path was nearly a trench, and we passed another group already returning to the descent route. They raised their gloved hands, and one by one, high-fived me. I've felt giddy on many summits and overwrought (depending on how severe I expected the way down to be), but I don't think I've ever wept before. I realized that I truly hadn't known whether I would climb again, whether I would experience this grandeur again. In fact, I wasn't sure I would be alive at all. But I was here, now, and I felt I'd been granted a great reprieve. For one crazy hypoxic moment, I thought I was walking through the gates of heaven. this is what the simplest nomad knows. Snyder and Mallory, Arnold and Hoffman, Lowry and I. Are we all really just searching for what the simplest nomad knows? In his eighty-third year, Snyder still lives in the Sierra Nevada in Kitkitdizze, the mountain home he built for his family in 1970. Perhaps the last words Craig Arnold wrote appear in an entry from April 26, 2009. They describe the smell of the ashitaba leaf when it is crushed in your hands: It is the smell of a world in which there is nothing rotten or putrid or sulfurous, a world in which all those things have been rinsed away. His wife, Vera, who assembled the book for publication eight years after his death, explains that this is a "more disturbing and fruitful question than the numerous stock answers made to it, a question each of us must finally answer for himself." Daumal must have known it's not the object of our seeking, the grail, but the seeking itself that is its own answer. Surely, these volcano poets were, or are, all seekers, though who among them has said what exactly they sought? Hoffman left fragments; Lowry bequeathed his rich and lush narrative prose. Truman and Maridjan, fixed for eternity on their home mountains, must have found something they were unwilling to abandon. As I write this, a sultan in Indonesia contemplates the appointment of a new spiritual gatekeeper, poets take up their pens, and climbers tie into ropes, preparing for ascent.